I told you all how Jayden recently started a part time preschool with his friend Aidan. Its going great and he loves it, besides the fact that he doesn't get his naps. But with going to school as a parent you have to worry about what you send to school coming back with your child. Parents spend lots of money to provide for their child. And nothing is more frustrating then to have your child come home from school with out those materials, such as a coat, back pack, lunch box, etc. One way to help hold on to those items is to label them. Jayden takes his own lunch daily and in that includes some sippy cups, as well as a sweater and backpack. I like any parent did not want those items to get lost. I was very excited to get some lovable labels for review and even better I was sent the split pack. I was able to get a pack of labels for Jayden as well as some for Aidan. The split pack is a large value pack with a single design and two names. It works great for siblings or best friends. There are 12 designs, colors, and icons to choose from. These labels are dishwasher and microwave safe. Additionally they are waterproof and UV Resistant. We chose to get the Movin' and Grovin' pack for the boys. It was perfect because all boys love things that go. Aidan is a huge train fan and Jayden loves firetrucks. At school Aidan and Jayden have many similar items as other children do in the classroom. It is nice to know that items such as their sippy cups are labeled with their name and won't be mistaken for another child's. I love these labels and so does Aidan's mom. Jayden and Aidan of course love having their name on things. And they like that they can identify their own items. With 12 children in their preschool class it is easy and fun to identify which lunch is theirs in the refrigerator. 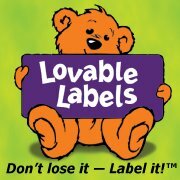 Lovable Labels has a large variety of labeling products including bag tags, safety, and household labels. You and your children will have a fun time labeling everything around your home. Win it: One (1) Arizona Mama reader will win a Lovable Labels Split Pack of their own. Enter in the Rafflecopter form below! This giveaway will be open until 4/25 at 12:01AM (EST). Thank you to Lovable Labels for sponsoring this review and giveaway. I really like the Toddler Toes labels! I would choose the Split Pack for my two grandsons to share! I'd choose the Lovable Labels Split Pack for my son and daughter. I would choose the camp pack for my son as it would let me label EVERYTHING that goes to daycare so I ensure it makes it back home again! I love the Toy bin labels, they would come in very handy in my house I love being organized the best I can. I learned that these labels: Keep toys and art supplies from turning into clutter with these organizing labels. Little ones who may not know how to read can still help tidy-up by using the toy symbols on the labels to put away toys in the corresponding bins! i love their shoe labels! I like the bag tags. I would choose the licorice twist pack and it would be for my boys. I love the Crown Fun Stickies! I would get the Nature Lover and they would be for my nieces for Christmas! :-) Never too early to start planning for Christmas! We love their bag tags. I would get the split pack for my nieces.